Tomka tending to his friend Çelo after he was attacked by a German soldier. I'm probably the only one of Xhanfise Keko’s kids that was not hand picked by her on a visit to a local schoolyard in Tirana. Instead, she found me already on the lot at the Kinostudio. 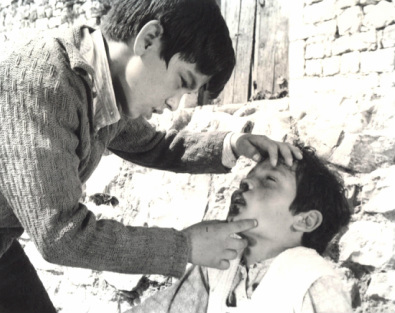 In 1976 I was selected by one of Albania’s best known filmmakers Dhimiter Anagnosti to play the role of Lelo in the film Lulëkuqet Mbi Mure (Red Poppies on the Wall). Seeing me nearly everyday at the Kinostudio, one day when she was preparing to shoot her feature film The Sounds of War, Xhanfise Keko asked me to do a screen test for the role of Bardhi, the lead character in the film. I did the test, but I didn’t win the role. A year later, and by now having seen my performances in Anagnosti’s Red Poppies on the Wall and Viktor Gjika’s The Man with the Ball (1977), she came to me to ask me if I would be interested in playing the role of Tomka in her next film. I accepted the invitation with pleasure. I was thirteen at the time, and I cannot lie, I really enjoyed being part of the enchanted world of cinema. We got a lot of opportunities that the average Albanian kid never could have imagined. Of course, I could never have predicted that the role of Tomka would be the role for which I would always be remembered. Still today, in the streets of Tirana or wherever I go where there are Albanians of our generation, I hear the words “Here ... here ... here comes Tomka!” I even have a friend who named his child after the character because he loved the film so much. I remember in 1977, waiting impatiently, pacing back and forth one day near her office at the Kinostudio to find out when my audition would be for Tomka and stressing out about whether I would get the role or not, when Teta Xhano came to me and said, "Enea, I decided not to have you do a try out for the role of Tomka because I am convinced that you can do it better than anyone else." We never really forget what happens to us as children, and I have to say that many of my experiences as a child actor were formidable and have had a lasting impact on me. But, more than nostalgic notions of being on set and making movies and thinking about some Golden Age of Albanian cinema, or of the creative collaborations between actor and director, I must confess that what I remember most about working with Xhanfise Keko are some of the tougher times we had relating to each other. I was not an easy kid, and she and I clashed, more than once. I definitely had a flair for mischief as a young teenager. I loved to take the piss out of people and pull pranks. And, in some ways, the five lead actors in Tomka were divided into two rival factions during the beginning of our time in Berat—there were two competing captains—me and Herion Mustafaraj. I really did cause a stir at first! After the crews had prepared the locations and the shootings schedules, and daily shooting was ready to begin, all the actors came to the set, hitting their marks and ready to work, except for one. I decided not to show up with the rest. Why? Because I loved to hide and then to watch the crew and other actors hunting all over for me, getting frustrated looking all over for "Tomka," sometimes for minutes, sometimes for hours. Yes, even when I was on set and seemingly ready to shoot, I would often be the one who didn’t prepare my lines. Why, you ask again? Because I was a bit of a cut up, and a rebel, and I liked to push people’s buttons and see shouting matches erupt on set among the cast and crew. For an outsider who doesn’t understand how films are made, this might not seem like such a big deal—you might think it's just another instance of a young teenager with a chip on his shoulder, simply responding to his own childish whim. But, in fact, all my childish pranks had serious repercussions. Shooting on 35mm film was extremely expensive, and as soon as the cameras rolled, precious film was being exposed and every time I pulled a prank, it was wasted film. Albania was a poor country in the 1970s, and film stock was really expensive, so every time I did this, I was wasting more money than I could have ever imagined, and the director and producers knew that if I kept up this behavior the film might never get made. They would run out of money and film stock if they couldn’t find a way to get me in line. I cannot imagine now, what it would have been like being Teta Xhano in this situation. At 13, I was very pleased with myself for playing these games, but Teta Xhano was at her wits’ end, between all the work to prepare for three months of shooting on location with a troupe of child actors, and then add to this the endless surprises I was tossing her way. She did her best to treat me with the same maternal care and speak to me in the same maternal tone that she did all the other kids who were better behaved on set. She encouraged me to stay focused and to prepare. Out of one side of my mouth I would say “Yes,” to her, and out of the other I would ignore all her instructions. It got so bad for everyone, that she finally gave up and decided to replace me with a new actor. But, she couldn’t stick with this, because, I later learned she still really wanted me for the role and didn’t think any other kid truly fit the part. She soon regretted this decision, and the fact that she let my rebellious attitude get to her. Finally, she and the producers came up with a solution. They sent for my mother and a “nanny” to come to Berat just to be my chaperones for the filming. This would mean I would always have people on my tail and I would have to fall in line. Today, I am aware that with all of my hijinks I had really worn poor Teta Xhano down. She was of course upset with me, but also worried about me, and for me. I am convinced that she really loved me, and as everyone who knew and loved Teta Xhano and had the fortune of working with her can attest to, she really had the spirit of a child within her. Thanks to her love I overcame emotional struggles within me that I didn’t know how to process in any other way except through acting out. Once we got over those initial hurdles of establishing a trusting, working relationship, we loved and respected each other. And, this goes for everyone that worked on Tomka and His Friends. We really established a kinship and trust on that set. If I were to compare the relationships I had with each of the directors I had the fortune to work with as a child, I think, unlike Dhimiter Anagnosti , who shot scenes with children differently than those he shot with adults, or kept the set closed when shooting with child actors, or Victor Gjika, who was able to elicit great performances from adult actors, Xhanfise Keko was a totally different kind of director. She worked with us kids to build close relationships and communicate more humanely with us, especially with her child actors. And, she continued to keep contact with us long after our work filming together was done . She was unique among Albanian directors in her devotion to children and her ability to give us the space and freedom to develop our own interpretations of the world that we could convey to audiences through our screen performances, but that we carried with us long after the cameras stopped rolling. I have reached the conclusion that such a relationship can only exist between mother and child. Teta Xhano had a boundless energy, an extraordinary patience, an admirable perseverance, an unprecedented generosity, and unimaginable tolerance. These are characteristics that I believe a mother can have only for her own children, but that she displayed with all of her kids. While these qualities did not guarantee her success in all the films she made over the course of her career, she is without a doubt, the unprecedented artist of children’s films in Albania. Teta Xhano saw the blood, and she jumped up out of her chair, chasing after us, “Uaaaa ! “ At that point, we all burst out laughing, we laughed so hard we nearly cried. That day, I felt pleased and proud that finally, we managed to play our parts with the authenticity Teta Xhano asked of us. My final thoughts on Xhanifse Keko, that I have thought to myself many times, but that I will now confess publicly—everything I learned about acting and channeling my feelings and emotions into my craft I learned from Teta Xhano. Enea Zheku was born and raised in Tirana, Albania, where he still makes his home. He went on acting in Kinostudio productions until 1986. He studied drama at the Art Academy of Tirana, and he currently owns and operates a restaurant in Tirana.